A minority of chipping operations are performed in conjunction with cable yarding, as operators generally prefer to produce chips under easier harvesting conditions. However, several reasons may occasionally justify chipping at yarder landings, the primary reason being the disposal of logging residue. 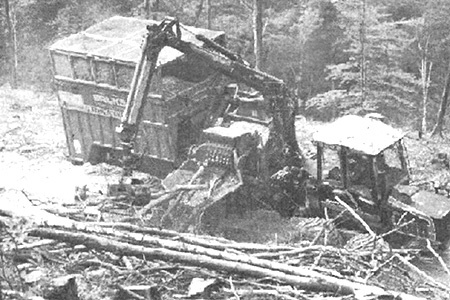 The accumulation of logging residue at a yarder landing is the result of whole-tree extraction, which is resorted to when difficult terrain makes stump-site processing excessively slow and dangerous. Residue generated from processing must be removed as yarding proceeds, or after it has been concluded. A fundamental condition for the chipping of residue is the availability of a market within reasonable distance from the harvest site. Such markets could be particleboard factories and heating plants - the latter being more common in the mountain regions where cable yarding is performed. In fact, the number of chip-fed heating plants is growing very rapidly in the country, which makes chip production an increasingly interesting business. Within the scope of a larger project on in-woods chipping, we collected data from 15 cases where such operations followed cable extraction. For each trial we performed a detailed time-motion study, using a stopwatch. The chipper operation was split into a number of characteristic elements, namely positioning, chipping and other work. The volume of chips produced in each trial was measured with a 20 m logging tape. At least part of this volume would be loaded on a vehicle and scaled on a certified weighbridge. We also counted all the wood pieces entering each load, in order to obtain the average piece size. Site and weather conditions, stand type, machine characteristics, operational mode and crew size were all noted on the study form. In particular, we noted machine type and power, the feeding system, load presentation and chip collection system. Accidents, breakdowns, interruptions and other disturbances were reported separately, but excluded from the time study. To be valid a trial should last at least half a day - or long enough to complete a whole load. This was based on the assumption that all crews studied were well acquainted with their machines, followed an established procedure and had reached a consistent performance level. Anyway, the majority of trials lasted one or more days and included many loads. All trials were carried out in Italy, except for three operations that took place just across the border in the Italian-speaking district of Switzerland (Canton Ticino). A description of the 15 case studies is shown in Appendix A: 60 percent of the cases come from the Apennines and 40 percent from the Alps. Most chippers found at yarder landings have independent engines, rated between 200 and 300 kW. Smaller units are occasionally found in the Apennines and they are hand-fed. All the rest are crane-fed. Hand-fed chippers always produce less than 3 green tonnes per Productive Machine Hour (gt/PMH0), whereas crane-fed units can go anywhere between 6 and over 20 gt/PMH, depending on piece size. Most operators began in the chipping business with PTO-driven models, which were chosen for their comparatively low purchase prices and for the flexible use they allow of the prime mover. However, many have turned to independently powered machines, either towed or self-propelled. Specialized chipping operations always employ powerful, crane-fed chippers. Disc chippers are used most, and they are exclusive to the Apennines. However, drum chippers are leading the recent revival of chipping and they are well represented in the Alps. The recent preference for drum chippers is because of the increasing popularity of fuel chips, which are produced from smaller material. Disc chippers perform best with solid wood, but cannot break down entirely fine, flexible branches. In the Apennines, particleboard factories still represent the main outlet for chip producers. Particleboard factories do not have special requirements for small piece sizes and, when they do, they prefer larger particles, which are best produced by feeding stemwood into a disc chipper. Most operators work cold decks. The occasional hot deck operations always include a tractor that moves the wood from the yarder chute to the chipper. When producing fuel chips, several operators prefer to let the residue dry on the landing before chipping. However, seasoning time should not be extended too much: long storage can generate some difficulties, especially if it concerns tops or whole trees. As the tops sit, their branches bind together. The binding gets stronger with storage time and with the total weight compressing the tops. It gets strongest in the bottom layers, and in those piles that sit for some time under snow. Disentangling long-stored tops requires a powerful loader. Besides, excessively dry wood generates a lot of dust and tends to break easily, forcing the loader to pick up the same piece - or its fragments - multiple times. Rotten wood is also problematic: it is often reported to choke chippers, the fact being explained by its capacity to plug knife pockets and disc slots alike. Chips are produced from all kinds of wood: logs, tops, slash and even whole-trees. Whole-tree chipping is generally reserved to small trees that can yield limited amounts of commercial assortments. Engine power and piece size are the main factors determining chipper productivity. Any given chipper will reach an increasingly higher production rate with increasing piece size - within the limits of machine capacity, of course. At yarder landings, limited available space is often a main constraint, imposing close cooperation between the yarding, chipping and transportation crews. Chipping requires the correct positioning of at least three elements: the woodpile, the chipper and the chip discharge. The loader may represent a fourth element to position if the chipper lacks its own integral loader. Chip discharge presents many alternatives. Blowing the chip directly into a truck saves space and additional loading costs. The direct discharge option can take advantage of the lateral dumping capability of some trucks and trailers. In this case, the bin can be tilted towards the chip spout to facilitate proper filling and prevent spillovers. But discharging into a truck requires very careful organization, to avoid waiting times for either machine. 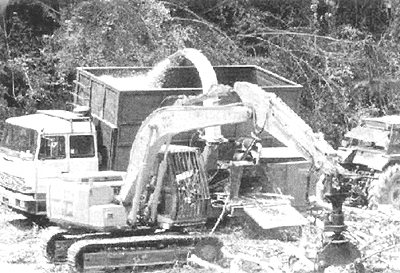 In some cases, the chipper is used as a stand-by piece of equipment operated only when a truck is available. On the other hand, idling a large chipper while waiting for the next truck can be quite costly. The reverse situation - filling a large truck with a small chipper - is also problematic. It requires too long and imposes an excessive terminal time on the most expensive machine in this situation, the truck. Besides, coordinating sustained truck traffic on narrow mountain roads can be quite difficult. To avoid the problem, one may discharge directly onto the ground, building up large heaps. This way neither the chipper nor the truck will be forced to wait for one another: each will be operated freely, when it fits best into the overall organization of the entire operation. Besides, subsequent reloading into a truck may take less time than direct discharge - especially if the chipper is comparably small. Several loggers keep an old loader parked at the landing, so that the truck drivers can load their trucks themselves, without waiting for anyone. Reloading a standard 26 tonne truck-and-trailer unit takes about one hour, considerably less than filling it up directly with a medium-sized chipper. Unfortunately, heaps take a lot of space, which may be prohibitive at a yarder landing. The space requirements of heap building can be reduced with a small bulldozer. Several loggers keep this machine at the landing and use it for a number of tasks. One such task is raising the chip heap, which is done by building a ramp up the pile and pushing the chip all the way to the top. This allows packing very large quantities of chips into comparably small landings. The use of containers would offer the same advantage of heap building, i.e. limited waiting times. However, this solution is not very popular among Italian loggers, who dislike the extra tare weight and the cost of the container system. Besides, containers can be difficult to handle in narrow landings. Weather may represent a further constraint when working yarder landings. The snow and the cold take their toll, and they can interrupt operations. Starting the day with a flat battery is not uncommon. Fortunately, this is an annoyance rather than a serious problem: If other equipment is on the spot, one can always jump-start the chipper. Very cold weather brings other surprises: If the chipper stays out at night with temperatures well below freezing, any wet chip left in the system can freeze solid. This can create considerable trouble when starting in the morning. The engine will die as the operator clutches in. He will then need much effort, a lot of hot water and possibly an iron bar to clear the frozen chip. Therefore, if one expects very cold weather overnight, he should thoroughly clean the chipper before leaving for home.